The same and yet not. All right, I am a huge fan of Thorne’s debut, The Hating Game. It was my favorite read of 2018, I read it four times. So naturally I had to read and review this story too. Let’s say it falls into the really enjoyed it category and I’ll probably read it a second time, just to savor the moment. Except I learned two things, one I really enjoy Thorne’s writing style. Two, comparing a book to another book when they are completely different is not exactly fair. So, I’m going to try this from a different approach. Did I like the story? Yes. Would I read it again? Yes. The characters are fresh with a hero who’s got the body of an Alpha, but is really just a teddy bear. Then there’s Darcy. Of course this story is told from a first person POV. There’s a depth of character in the heroine, Darcy that I can relate to. She’s a gal who’s gotten tough because to be anything else would make her the same weak little girl she was as a child. A girl with a weak heart. Darcy and Tom both hide a lot of scars. So not only is the hero her brother’s best friend, but the baggage is metric ton size. Her weak heart, his poor background and need to prove himself, her desire to find purpose again and his concerns of never being enough. Weeding through it is a windy, twisting path that only Thorne could navigate. This is where things got tricky for me. There is a lot of contradiction between the characters, with what they say and do. I also found Darcy’s constant need to flirt with her health, and take unnecessary risks annoying. There are some great secondary characters, even the workers and Thorne really knows how to craft them. But that was my final hold up – Darcy’s relationship with her brother. Now, let it be said I have two children, close in age, much like the twins in this story. These two are the best of friends and the worst of enemies on a good day. Maybe that’s why the childish behavior Darcy de-evolves to around her brother annoys the bejeezus out of me. To the point, I wanted to send both of them to their room because the brother doesn’t let up either. Of course, some would say the author is doing their job if they can evoke a large amount of emotions from a reader. Outside of this setting, pacing are all spot on. 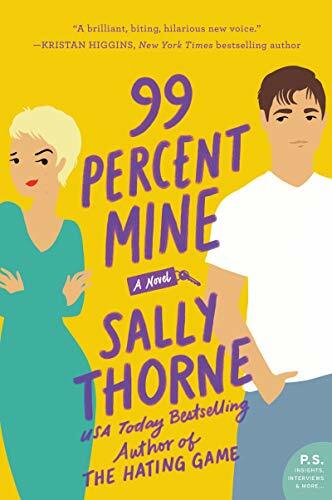 Overall, there are plenty of laughs, some hijinks, a fabulous brother’s best friend romance trope, and ultimately an HEA. Thorne definitely displays some chops for creating romance narratives in the first person that grip on and hold tight. As well as voice that is unique in its own right, even if not my favorite. For readers who enjoyed The Hating Game or Alexa Martin.